3/8” thick glass plaques are mounted to walnut background. Aluminum rosettes cover the mounting hardware. Plaque sizes and quantities are as size of the plaques vary from 9" x 12 to 3" x 6". 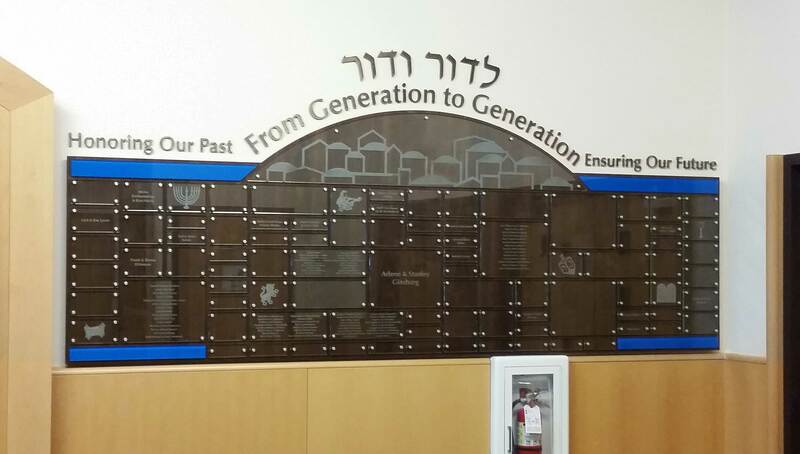 The inscriptions are sandblasted on the face of 20 assorted plaques. 2- 2” x 20”, and 2- 2” x 28 blue glass bars accent the design. A Jerusalem scene is sandblasted into the face of an 11" x 59” glass panel. 2”, 3” and 4" individual oxidized brass letters title the wall. The overall size is of the design is approximately 51" x 112”.